← My top ten workout tips! 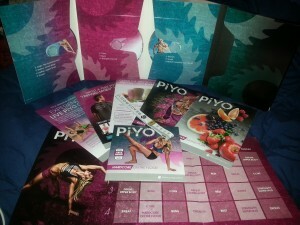 My entire PiYo program! Happy face not pictured because it would’ve taken up the entire photo. The workouts range from 25-45 minutes, most of which are 25-35. PiYo is low impact, high intensity, and combines cardio, yoga, pilates, and strength training with no weightss. And I’m starting a challenge group for it in July! I have three people already signed up and have room for a few more. Posted on June 25, 2014, in PiYo and tagged fitness, fitness challenge, great deals, PiYo, workouts. Bookmark the permalink. 695Leave a Commenthttp%3A%2F%2Fwww.teaaddictedgeek.com%2F%3Fp%3D695More+about+PiYo%212014-06-25+14%3A30%3A47Andrea+Bermanhttp%3A%2F%2Fwww.teaaddictedgeek.com%2F%3Fp%3D695.